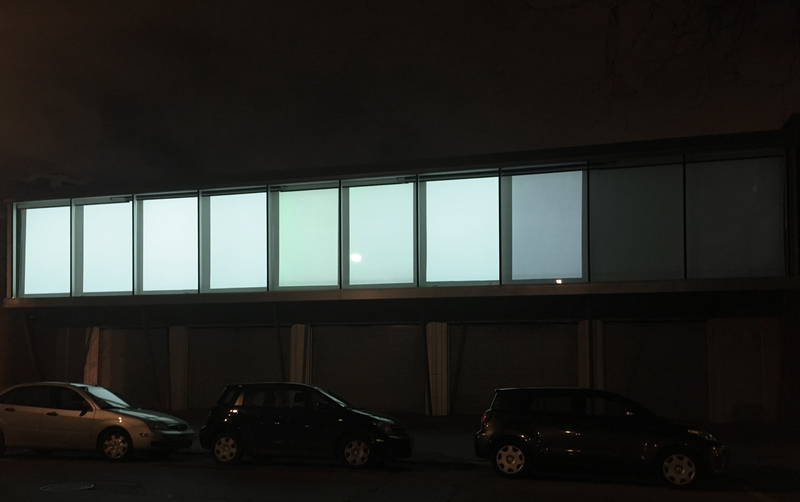 On view after hours on the facade of the Hyde Park Art Center, Jan Tichy’s “Installation no. 21” is a billboard-sized, site-specific digital projection that illuminates the neighborhood in wondrous and peculiar ways between light and darkness, brightness and shadow, the visible and the invisible. The artist works in the intersection of various media—namely, photography, video, sound, sculpture and architecture—binding them together in many of his works. This presentation on the art center’s Jackman Goldwasser Catwalk is the latest in a long list of Tichy’s site-specific installations, all of which use video projection to reimagine space and architecture. In this case, shadows and white light illuminate the interior and exterior of the Hyde Park building with abstract patterns and geometric shapes, giving it an otherworldly appearance. With the slow transitioning of light and darkness via meditative, time-based animations, Tichy brings the street-bound spectator into his work. This almost hypnotizing sequence inevitably persuades a look inwards. Installations on the catwalk gallery can be viewed only from the outside of the building and only from 8pm to midnight when the Hyde Park Art Center is closed. Taking advantage of this unique space, Tichy aims to shed light to the hidden histories of the building, but in reality, his work achieves much more. Through the digital mural’s repetitive sequence he manages to infiltrate the viewer’s psyche, blurring lines between consciousness and unconsciousness.